In a dining area capable of seating about 180 inside and 50 outside, there are Ban Marie’s set up for 80 cooked ingredients, many of them are favourites from Chinese and Thai cuisine, as well as an assortment of Sushi, and Sashimi. Then there are the raw Meat, Fish, Shellfish, and vegetables that you can select and to take to the Wok, Teppanyaky, or Bar-B-Q for cooking. With a modest selection of desserts, ice creams, and fresh fruit to follow. I will not attempt to list what’s on offer, suffice it to say, if you can name it, in all likelihood it will be there, including Crab, Lobster, and Dim sum! The choice, for some people can be daunting, and because all of this is for one set price, there is a big temptation to over eat, but this is a real family happening, kids love it, as do their parents, and for the budget minded, a lunchtime meal costs 9.95 euro and an evening meal 11.95 euro with children from 4-8 years eating for half price. Drinks are extra and all are +8% IVA. Fiesta days are priced at 12.95 euro. The grand opening was in the evening of 15th June 2012, and the owners, Xiao and Lan greeted their diners warmly. They ran La Luna, a small sushi bar in the pedestrian precinct of San Pedro. This is a much bigger undertaking and they should be proud of the operation they have created, not only because of the quality, freshness and variety of the ingredients, but also how smoothly the first day went. I was amazed at how many people seemed to know of the opening, because their only publicity, as far as I could determine was only a banner outside. We only found out by accident on that very morning. We enjoyed the experience very much, albeit with some difficulty in identifying some of the less obvious dishes (please add labels). Of the 5 other Woks we have been to, this is among the very best, possibly THE best, we will see on our repeat visit, whenever that is, if this standard is maintained. Stats: There is no closing day. They can be reach on 951969047 and by email woksanpedro@gmail.com, although reservation are not necessary, unless you have a very large party. They open for lunch from 12:30 to 16:00 and for dinner from 19:30 till midnight. 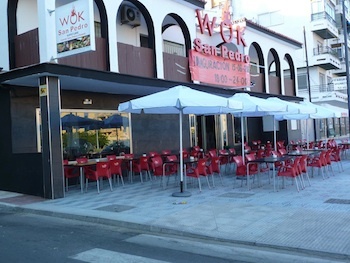 Their web site is www.woksanpedro.com where, amongst other things, they will have a take-away menu available shortly. in front of you a la plancha. It worked out at 14 euro for adults and 6 euro for the kids. Couldn't fault it either on quality or price and the place was very busy. Must try the Wok San Pedro one next time! We tried out the Wok today and I got exactly what I expected. Morris' review is pretty spot on. I am not a fan of buffet style restaurants, but we were walking by on our way elsewhere and decided to give it a go. The first thing I notice when I step into a restaurant is the cleanliness and ambience. I was pleased to find that the restaurant is pretty clean, particularly for a buffet style restaurant where kids can go and help themselves leaving a mess behind. 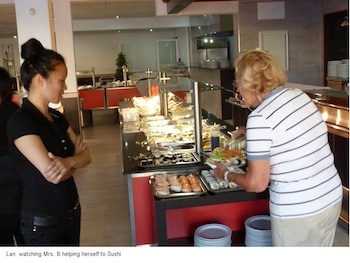 The staff were walking around wiping down counters and refilling the buffet trays. The floors were clean and tables, silverware, chairs and glasses didn't have any stains or damages. The ambience is probably the biggest downer for me. It is a large banquet hall without much character. It was a good thing that it was pretty busy and gave it a bit more ambience. I would have probably walked away if I saw an empty restaurant. I noticed the staff warmly greeting their regular customers with handshakes and kisses, which is also a good sign that people seem happy here and are willing to come back. The buffet had plenty to offer and looked like it was fresh. I am a big fan of sushi and was a bit disappointed with their rolls, but at a Chinese buffet I really can't expect the same quality you would get at a Japanese restaurant. Fair enough. I built my own wok meal with plenty of vegetables and added some shrimp. The food was cooked well, but I thought they added a bit too much sauce. I also took a simple fish (looked like Dorado cut in half) and they grilled this for me. It was pretty similar to what you would find in a chiringuito on the beach and I was pleasantly surprised. I didn't ask for any sauce or spices. I just gave the chef my fish and let him do whatever it is he does. And it was great! So, my recommendation to you is to "keep it simple" and stick to the Grill Bar. In the end, my kids loved it. 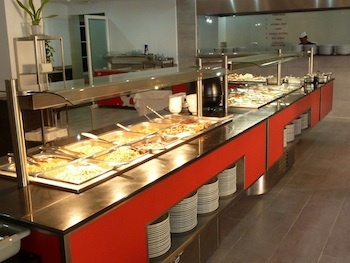 They are huge fans of buffet style eating and love to experiment with all the flavors and choices. So, if you've got fussy eaters or kids like mine who just want to taste everything, the Wok San Pedro is perfect. We hit the restaurant for a Saturday lunch and wound up paying a total of 65 euro for the four of us. My kids wound up paying the adult price, we all had a bottle of water each, and I guess there was tax added to this and...voila! Not cheap, but if you really take advantage of the all-you-can-eat option, you may come out with good value. Although, I think the Wok has its advantages and can offer good value to some families, I personally would rather spend the same amount of money at Passion Cafe or Terra Sana. But that's just me.